Memphis has been bitterly cold for the past week. Last night, we finally got some pay off in the form of an inch or so of slushy white powder. 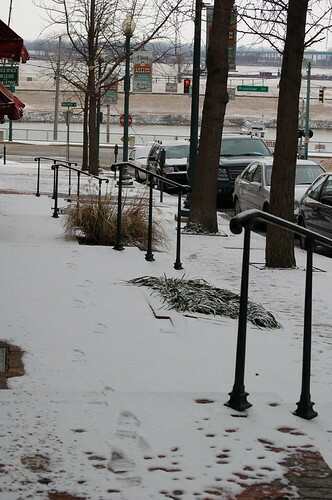 Memphis is funny about snow days. They’re highly anticipated. Kids are excited, employees are freaked out about driving to work, and the grocery stores are packed with people inexplicably buying up all of the milk and bread. I’m pretty sure every time it gets this cold, people remember the ice storm we had in 1994, when the power was out for several days. They just want to be prepared. Either that, or milk has some magical snow removal properties that I don’t know about. It’s nice to see the city at least a little bit snowy though, because when you don’t have snow days often, you learn to appreciate them fully. during the ice storm of 94, our power was out for 2 weeks. that’ll be a time I will not forget. LOL…my cousin told me how Memphians freak over the white stuff. We got just under 10ft of snow last year. Wonder what it will be like this year. The milk is for snow cream.